The avian retina is avascular. It can be divided in a photosensitive part (pars optica retinae) and a non-photosensitive part (pars caeca retinae). 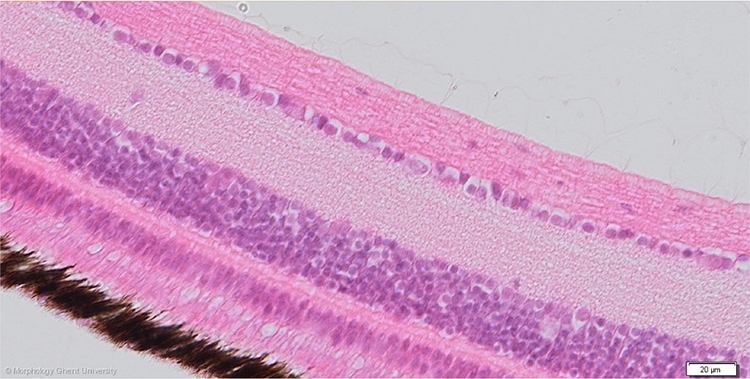 The pars optica retinae consists of two principal layers: an outer pigment cell layer and an inner sensory or nervous layer (stratum nervosum retinae), the latter subdivided into nine further layers. The pars optica retinae thus consists of: (1) the inner limiting membrane, (2) the nerve fiber layer, (3) the ganglion cell layer, (4) the internal plexiform layer, (5) the internal nuclear layer, (6) the external plexiform layer, (7) the external nuclear layer, (8) the external limiting membrane, (9) the layer of rods and cones, (10) the pigment cell layer.